Not at the gooseneck, just easing the topping lift down. I could not do it because the bimini was in the way. Back when you was sailing the boat without the bimini I don’t recall having this problem. We put the bimini back up a while ago but since then there have been few days sailing with a full main. Motoring down the ICW, or reefed in the trades. The few times I’ve had the full main up I could not get good shape. The leech is always loose, fluttering. I guess I just assumed that the boat was set up correctly when we got it. Bad assumption. Being bored yesterday I was poking around and noticed one of the 4 bimini arches was a bout 4” higher than the others, that is what limited the boom. So I lowered it, just backed out the setnscrew and brought it down. I hope it’s enough. Hard to explain why this idea didn’t dawn upon this bright light years sooner. Duuuh! Feeling kinda stupid. Will see if I can try it out tomorrow heading to St Lucia. Hard to tell, wind forecasts are generally spot on +/- about 100%. I’m hopeful. Well, that was better than getting the dawning while reinstalling the sail after the alteration at the sailmakers. So lowering the boom didn’t do much. 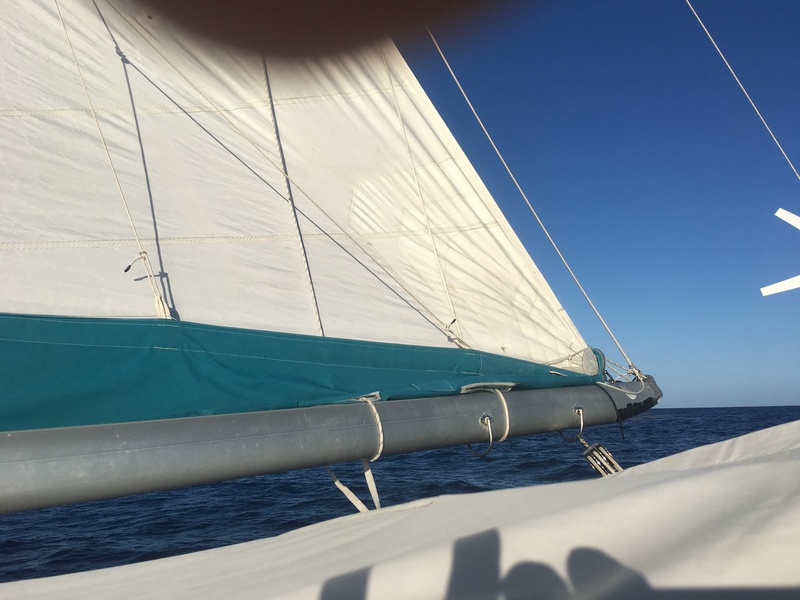 Here is a photo of the sail at about 15 knots, beating. This is the best shape I can get. I hear a lot and don’t go very fast. Is the sail cut wrong? 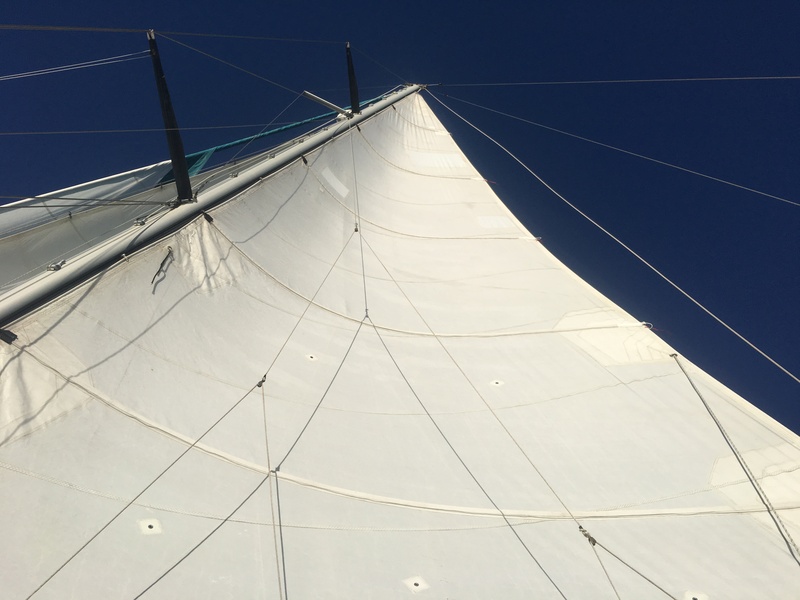 You probably need a mix of 1. more halyard tension, 2. more outhaul tension, 3. more vang tension, and/or 4. the traveler lowered to leeward so that the force is more vertical than it appears in the picture. Also battens top(1), 2, 3, and 4 probably could be a little stiffer. The sail itself does not appear blown out. 1) will tension the leech and luff. 2) will move the clue towards the end of the boom and flatten the lower middle of the sail taking some load off the battens and tension the leech a small amount by moving it further away from the head of the sail. 3) Vang tension will make the biggest difference since it will directly tension the leech and control twist. (adding leech telltales at each batter will give you a clew about whether the leech of the sail is stalled. 4) If you have a long enough traveler, dropping it to leeward will do the same thing as 3. When you do 3 or 4, you may need to ease the topping lift a little more. Thanks a lot for that. Comments on when the photo was taken. 1. More halyard tension - there is no more ME to tension the halyard with. Winch on mast is a #30, 2 speed. I still have a foot or so of halyard at the top of the mast, luff is real tight. 2. More outhaul tension. I may have something to work with there. Just checked, I had about 10 inches of adjustment left. The adjustment, with sail down, was made very easily, very little tension. 3. Vang was bar tight when I took this photo. 4. I’ve no traveller. Just a lad eye on the aft coach roof (center cockpit). 1985 44’ steel cutter, 40,000 pounds. Sails were new in 2006. If you look close you can see repair patches where squirrels got into it while stored in New Bern, NC 2 years ago. It’s a very heavy cloth. I’ll try her out with more outhaul tension next trip, I hope. 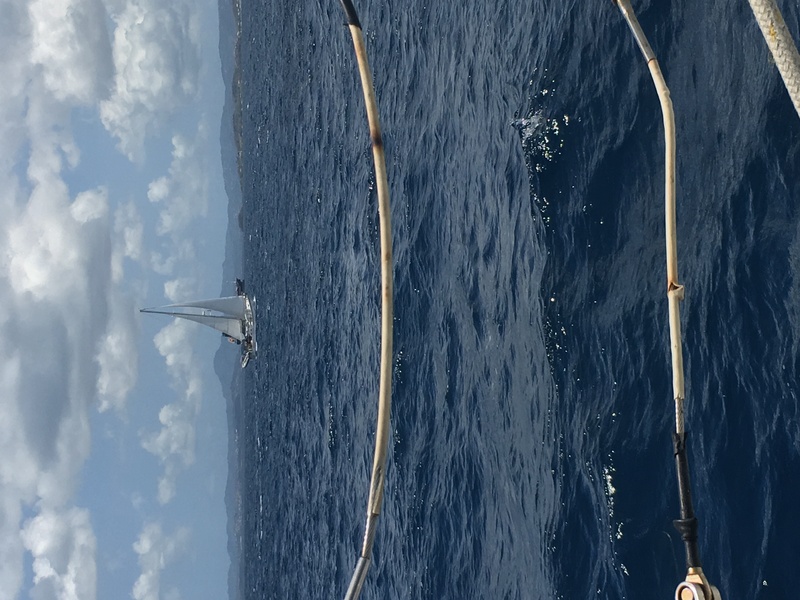 Sometimes too much wind to use full mainsail here in the Eastern Carib. Just me and the Wife, two ploinkers. Not very adventurous. Your reply was very much appreciated. It helps to talk things out. Last edited by hpeer; 1 Week Ago at 04:57 PM. Slow boat? Less than 15 knots (no whitecaps)? No doubt she is a slow boat. But I don’t blame her, I blame the Captain. About 15 knots. But the leech is always loose no matter the wind speed. Flapping in the breeze. The day or two before I was buddy boating with a Passport 42/43 and I was looking at the difference between his sail and ours and it was quite striking. 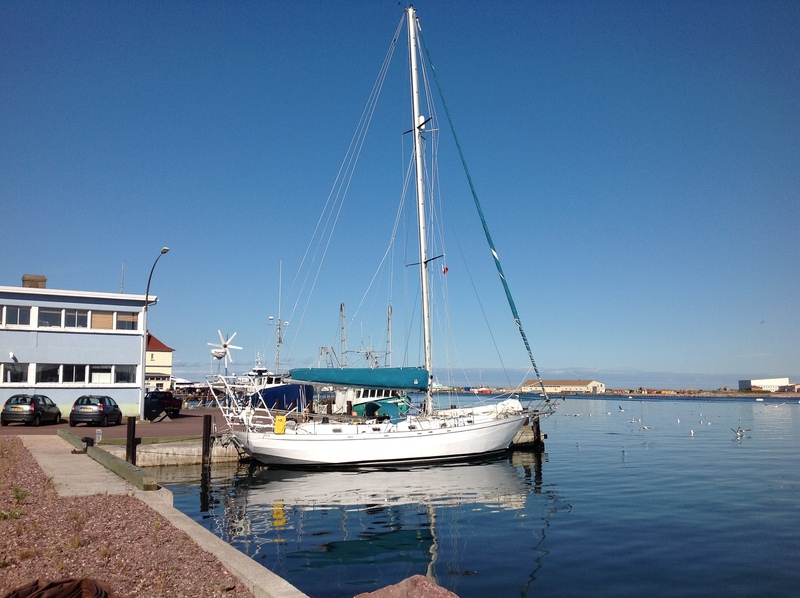 You gotta understand that I first sailed at 55, zero lessons, it was a 33’ steel cutter I singlehanded up the coast of Nova Scotia. I travelled a lot since then, a lot of either narrow water stuff and a lot of heating. This is our second boat. So I’ve never really learned to sail, never sailed on anyone else’s boat, never had another sailor on our boat. Just the way out life has been working out. We get around but it’s often not pretty. This was the day before. Can you rig a Cunningham? Would do the same as increasing halyard tension. Or sail with a reef in and more tension on the tack line. In the absence of a traveler can you rig two mainsheets toward the back(aft) part of the sail. One anchored at each side of the boat or the house. You have the hardware for one. Just need it’s twin and two new anchor points. This would serve the purpose of a traveler going upwind and vang only needed downwind. Or move one out to the rail. This would give more vertical downward force where you need it. On a prior boat used the tackle designated for use as a preventer temporarily directly below the boom end to bring it straight down went going upwind. Mainsail was stretched out and this helped some. You mentioned twice that the leach flutters excessively but no one has suggested tightening the leach line. It helps to talk things out. 1) With regards to the halyard tension, you should be able to get more a couple ways. Make sure that the boat is up in the wind with the vang and mainsheet eased and then really honk on it. You should be able to get more tension but maybe not since the stretch in the halyard may be all that is causing the appearance of an ease. Plan 'B' might be to go old school put a handy billy (small tackle) on the halyard with a rolling hitch and then use a winch to trim the handy billy. 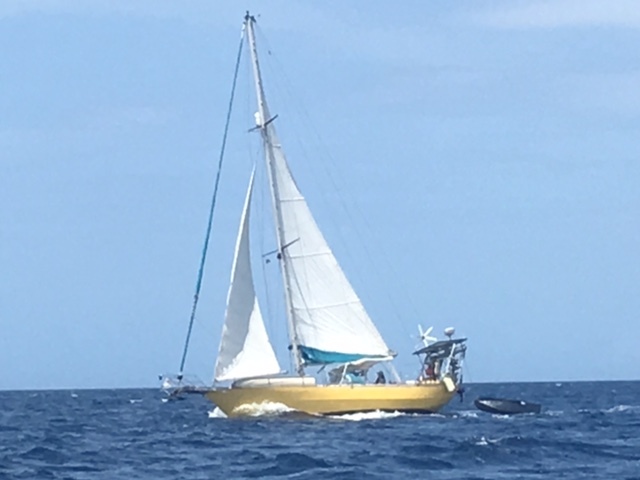 3) To increase vang tension, once the sail is fully up, and while the boat is head to wind really crank down on the mainsheet, that has more mechanical advantage than the vang. Then tension the vang as hard as you can. That should result in greater vang tension. Few cruising boat vangs can be tensioned under load without being led to winch. A cunningham is the opposite of what is needed. A Cunningham does not do the same thing as tightening the halyard. The Cunningham only tensions the luff of the sail. Because of that, when a Cunningham is used, the leech is relatively loose compared to the luff. The main halyard tightens both the leech and the luff at the same time. Since there are small scallops in the luff, I figured that both could use more tension. Once the main halyard is tensioned, the handy-billy can be taken to the leeward rail and used to tension the leech by pulling against the mainsheet to create a downward vector. The sail has a pretty nice flying shape. Tightening the leech line will cup the trailing edge of the sail between the battens- increasing heel and weather helm. That said, its an older sail and if all else fails, then a small amount of leech line might help.